It was a match-free day and our mentors allowed us have the morning to ourselves, so I enjoyed the comfort of my bed till 11 am. Our trip to Al Zaatari refugee camp had been moved to 1pm from 2pm and thank goodness the Wi-Fi in my room was sensible enough to let that message come through before taking off. I don't know why, but I can't browse in my room, the network just sneaks in and out. I missed breakfast and almost missed lunch since we were to leave at one. So the hungry Young Reporters went to a shop at Regency hotel. Regency is just a door away - and we got biscuits, chocolates, etc. to snack on. It was there I first noticed Indomie. I wanted to take a photo but couldn't because my SD card could not be found. I got three glucose biscuits for less than 1JD, coupled with the Pepsi Farah gave me. This was at about 1pm already and there was no bus yet. In that case we dashed to Regency for lunch, after which two buses arrived to take us to the refugee camp. It was on the bus that I realized I could no longer take photos because my memory card was damaged and my phone memory was full. I didn't know how to start imagining I had lost everything on my SD card of over two years especially the special moments I've had in Jordan so far. We got to the camp after over an hour, driving past deserts and barren lands. Crossing the gate, it was obvious these were a set of people limited in their right to freedom. It was like crossing the boundary that separates two countries. Already we had been told to bring our international passports and accreditations along. They were not necessarily checked, but our first stop was the Police department, from where we headed to the Asian Football Development Project and UEFA Foundation Sports centre where we saw girls training on a coal tar surface. It was their time to train and they do so in a covered space to truly express themselves. The boys training was slated for later and a barbed wire separated their training area from the girls'. The External Relations Officer of the camp, Gavin David White, explained to us that there are nine schools in camp running on a double shifting system. The girls go to school in the morning and the boys in the afternoon. 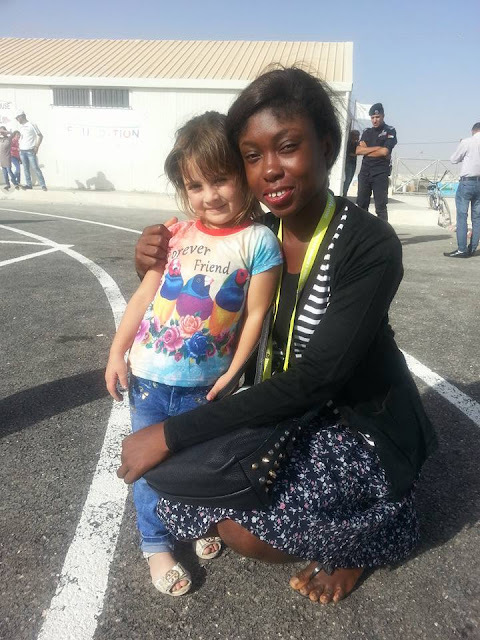 The first child I spoke to at the camp was Farah and I was truly amazed at her English. She told me her name and her age in English and I was very impressed with how smart this five year old was in spite of their predicaments. All the while Tracy and I were chatting with her, we failed to recognise that Farah was the super star we watched on the big screen on every match day when FIFA shows a clip of how children brings joy to children affected by conflict. I have admired her on the screen from day one and here I was with her in flesh, why then wouldn't I get a selfie. She is the last of five - four girls and one boy - and all of them are interested in football. Their mum is a coach, and Farah also wants to be a coach. She loves to play too. It was an emotional and rewarding experience for all of us (Young Reporters and Mentors) at the Refugee camp. Many a time, we do not appreciate what we've got until we see those who long for just a tiny piece. They give you a smile that goes beyond their war and conflict stories which has seen them walk miles to cross the Syrian border into Jordan. The current population stands at 80,000. They used to be more than that. Most of the children playing football know Ronaldo and Messi and want to be like them, but first they yearn for home even as they express deep meanings in the arts you find on their prefab homes. It was after our chat with White, we returned for the boys training. Playing football with them. They bring a ball to you and trust me, you cannot refuse them. I spoke with Farah's mum and she told me how Farah almost got missing when they were trying to flee Syria after a bomb explosion, the two-year-old at the time, had followed a man, whom she thought was her father. On our way out of the camp, we passed through the market which was quite decent had virtually everything you would find in a regular market. We got back to the hotel, had a chat with Keir who told us he needed us to submit our articles of the camp by 12pm the next day. I went up to my room, and tried in several ways to see if I could retrieve my important documents, images and videos on my memory card, all to no avail. Eventually I gave up and tried to format it that failed too. However, I still had to do my report for the radio station I work for in Nigeria, and write one other article before going to bed. Back home in Nigeria, it was all about Rangers winning the league. It was all over Twitter and Facebook and I felt good. If there was any consolation to losing whatever is in my SD card, it was this. Not because I am a fan of Rangers but because they truly deserved it.